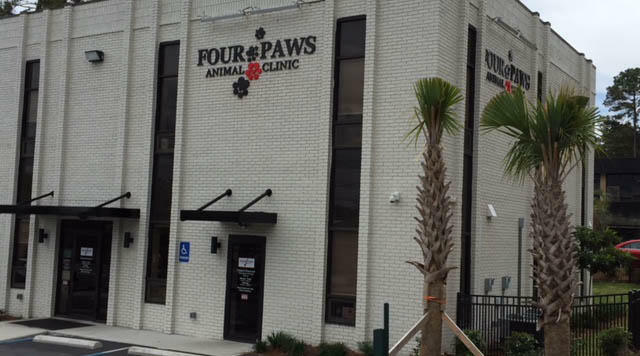 The new Four Paws Animal Clinic recently opened a few blocks from its former location after more than two years of operations in a temporary building while it recovered from the 2015 flood and sought the right place for its new home. For some, the so-called “thousand-year rain” and the floods that followed it in October 2015 may seem an event long past, but many are still recovering from the storm’s devastation. For some businesses in Richland County, the after effects of the floods continue to pose particular difficulties. Take the Four Paws Animal Clinic, which was forced to operate out of a temporary location for more than two years after the flood, when the business' original building bordering Gills Creek was ruined. It was only recently that Four Paws was finally able to move to a new location on Forest Acres. Listen to this story. Coverage of South Carolina flood recovery is made possible in part by a grant from the Corporation for Public Broadcasting. SC Focus is a production of SC Public Radio. Warren said the clinic got no help from FEMA, but its flood insurance ultimately did come through, enabling clinic to rebuild in a new location. Even more challenging, however, was replacing the countless pieces of underinsured equipment that were lost. 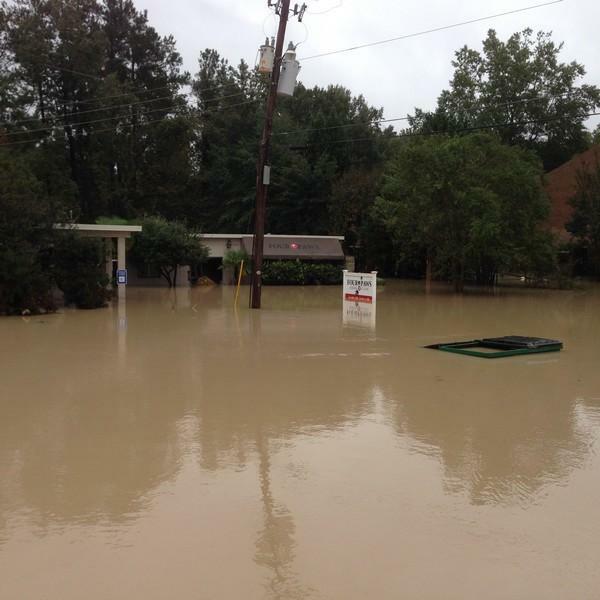 Four Paws Animal Clinic was almost completely submerged by flood waters following the historic rains of Oct. 4, 2015. The clinic was able recently to reopen back near its original location in Forest Acres near Columbia. Some equipment was replaced by insurance, but it was the generosity of other vets around the country that helped the clinic most. Now that Four Paws has largely recovered, Warren and her colleagues are determined to help similar businesses that become victims of floods. They’ve sent supplies and gift cards to clinics in Texas and Louisiana who lost their buildings and equipment in recent weather events. To Warren, this is a better method of coping than dwelling on her own losses, which were significant. When the rain came in 2015, 4 Paws was just a year away from paying off their loan. The greatest positive, however, was that no animals were in the clinic at the time of the flood, so no animals or staff were harmed. On the other hand, some businesses are still working to replace buildings destroyed by the flood. Across town, Harmony School, a non-profit, private elementary school near Eight Mile Creek, has yet to break ground on a new class building to replace the pre-school building destroyed in the flood. While plans have been drawn up for a new building that will be completely out of the flood plain where the old building sits (the remaining structure is still used for storage, but not fit for hosting classes), the groundbreaking won’t the ready to take place until later in 2018. School Administrator Jen Peterman said fundraisers have provided the money to get started on the new building. The kids have gotten involved in the efforts, from an oyster roast, to a rummage sale, to bringing in box tops. But by and large, raising money has been quite difficult. “We’ve applied for a few grants, but have been denied. It’s hard when you’re a non-profit, private school,” Peterman said. With less space, the Harmony has been forced to downsize its programs in the past few years, meaning fewer students are able to enroll. The waiting list for Harmony has grown to 60 kids. That’s one reason the new building is so important. In the meantime, the students at Harmony School have adapted to their temporary class arrangements in portables. Some of the youngest students can’t remember the flood, and never saw what the school looked like before. But others, like Jackson Morgan, have been enrolled at Harmony for years, and remember well. Jackson is looking forward to returning to the building where he made his first memories at Harmony, but he said he’s still enjoying school in the meantime. After the historic flood of October 2015 destroyed the 4 Paws Animal Clinic in the Columbia suburb of Forest Acres, a friend came to the rescue with a temporary site for the business. Dr. Nori Warren and her husband, Will, immediately began planning to a return to their original building, which was still structurally sound. When the historic floods hit the Midlands in October, many small businesses, like many homes, were inundated. Ceiling-high waters in low-lying areas would seem to ruin the businesses for good. But the owners are fighting back.